A highlight of our March meeting was the Kona solids distribution. We had signed up for a batch of Warm or Cool colors in quarter yard cuts (the smarties signed up for both!) and received about 26 of each color within each group. Aren't they pretty! Don't you wish you had participated? Can't wait to see what people do with these. We shared some of the cushion covers that were completed and they were fabulous! We are not showing any on the blog because we learned they will be shown as a small special exhibit at the Pennsylvania National Quilt Show at Oaks in September so they shouldn't be shown online before then. We can post them after the show in September. Really great representative work, showing just how rich we are in talent (and how eclectic we are!). How's that for a tease. Some of us didn't finish so we hope to see the rest at our regular meeting in April. Those are the cushion covers that will be submitted for the exhibit so get going! Show and Tell was great, as usual. This quilt is Cathy F.'s beautiful quilt. Danette had several quilts. She said she learned a lot while putting these together and she might do some things a little differently but we thought they were great as is! And I think we were all inspired by the solids, especially those of us going home with a batch of Moda solids! Stephanie had this very cheerful small quilt. Love the color combinations. Andrew made this raffle quilt to benefit an African village water project and we all agreed it would likely raise a lot of money! His employer had agreed to match whatever was raised in ticket sales and it was a bundle. Lucky winner was a co-worker of his. Many of us tried for it! Anna had two tops and as usual, her sense of color was exquisite. Loved them. 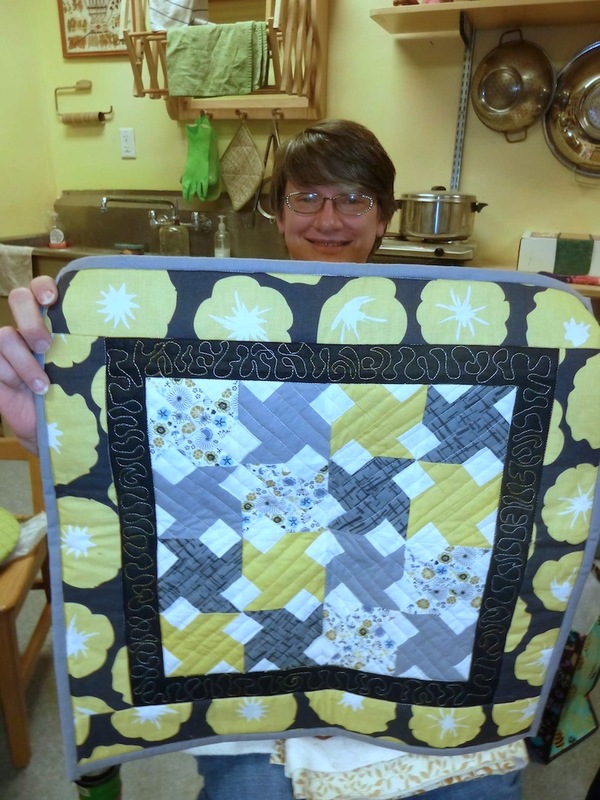 Ann finished her paper piecing with the challenge fabrics we had been given in January. She's new to paper piecing and this is amazing! Maybe she will turn it into her Cushion project? Bobbi made this tiny Red/White keychain for Kathy, in the spirit of the Sniper Quilts Kathy made for her son and his team since she had to give them away. Just a little thing, for Kathy to hang onto. Sarah also finished her challenge from last month. That border is great, those big happy flowers. But even more fun was her Tolkien quilt! So imaginative and clever! Can't wait to see this after she finished quilting it. Thank you to member Bobbi for the photos and write up!